Pontefract families and key local dignitaries turned out for an afternoon of property myth-busting this week, as Noble Homes introduced the latest phase of its Limetrees development. 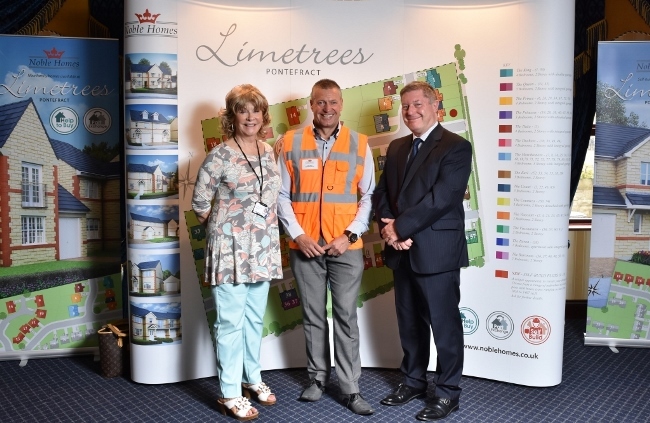 Noble Homes, a Yorkshire-based, family-run housing developer, hosted an exhibition event yesterday (Wednesday 10 August) to launch the second phase of its Limetrees estate in Pontefract. The free event, held at the King’s Croft Hotel, invited homeowners to seek advice on initiatives such as help-to-buy and part exchange, and aimed to dispel any post-Brexit purchase doubts. It came just days after the Resolution Foundation announced that homeownership in England has reached its lowest level in 30 years, with rising house prices and slow wage growth leaving millions unable to afford a deposit. Creating around 25 jobs for the local area, Limetrees’ latest phase features 84 new units, including 10 plots for self-build homes. Coun Denise Jeffrey, executive member for economic growth and skills at Wakefield Council, said: “Limetrees is a fantastic local development which has contributed to job creation in the area and brings wonderful new properties to Pontefract. The Limetrees development was first launched in 1988 and has since become a much-loved part of the town. Since beginning its latest phase, Noble Homes has been keen to help local residents understand the various options available to them when searching for their dream home, and reassure them a new home is still achievable following the EU Referendum result. The interactive event, held from 3pm to 8pm, also featured a selection of local suppliers offering a one-stop shop for those seeking advice. Potential buyers were welcomed by solicitors and interiors experts who provided advice on legal issues and how to make those all-important finishing touches. Those ready to secure a new home were also offered the chance to win a luxury Caribbean cruise with P&O cruises to celebrate their new dwelling. Now, Noble Homes is keen to stage similar events across Yorkshire to encourage more people to consider their position in the property market. Chris Noble, managing director at Noble Homes, said: “It’s been fantastic to meet the locals today and share our tips on homeownership. The idea was to get people in Pontefract feeling more positive about house-buying and allow them to ask those questions they’ve been wanting answers to.